CLEPA is the leading organisation representing the automotive supply industry in Europe and serves as the biggest forum for discussion and decision-making in the sector. 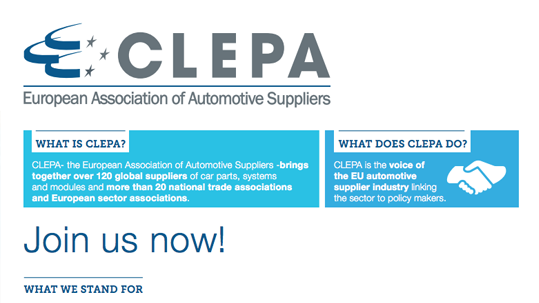 CLEPA is not only considered as a negotiating counterpart by the European Institutions and the UNECE, but also keeps regular contacts with fellow associations and with the car manufacturers (ACEA, JAMA, etc). Therefore CLEPA can give you contacts, expertise, opportunities and negotiating power to influence the political decisions touching your interests. CLEPA is the leading organisation representing the automotive supply industry in Europe and it is the biggest forum of discussion and decision-making in this sector.